This is the second post from my visit to Iceland and as always let me know what you think. My trip out of the country began with a marathon run thru the airport and only ended when I was greeted by my couch when I arrived back at my home. My destination was in Iceland and I found it true to its moniker “Land of Fire and Ice”. Upon viewing it in person, I was very cognizant of what had happened millions of years ago, but with one very important difference… it was now 2013. The land looked as if it had just cracked open yesterday and this was made more evident by its active volcanoes. I traveled in a 4×4 and van, with a small group of 8 photographers. I had mixed blessings on most of my trip by being with and without rain. The ‘with’ enabled my pictures to develop the drama and contrast needed to expose the real Iceland. The ‘without’ made it much more comfortable moving around and not having to wipe off my lens every minute. 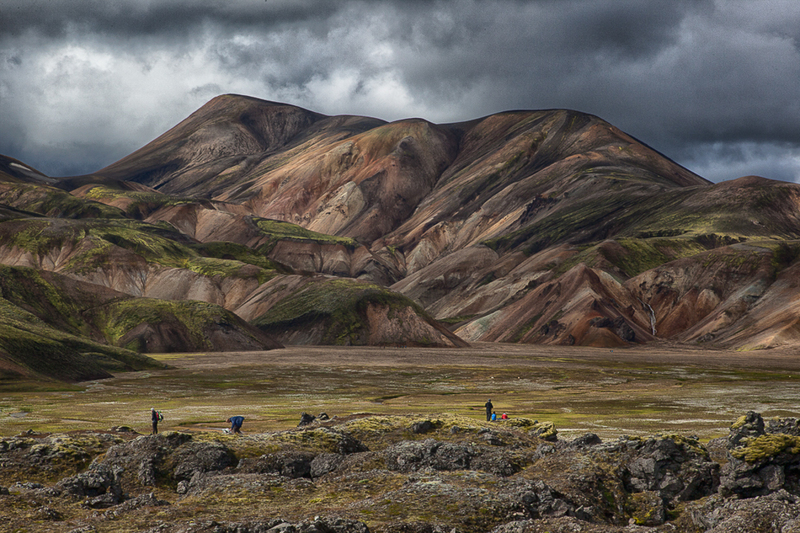 Trekking high above the island’s floor, I was presented with the fantastic colors of the highlands in Iceland. The way the browns and greens meshed and melted together, created a wonderful palette in front of me. As I stumbled over frozen lava fields and sweeping views of meadows and mountains, I just sat in the open wilderness and thought how lucky I was. Throughout my stay, I was able to visit very small hotels that provided exquisite meals made on the premises. The trip took me from the city life in Reykjavik to beaches and miles of mountains and waterfalls. The beaches were covered with black sand and beached ice which took on the look of a grand crystal glass shop stuck out in the middle of nowhere. Finding the right composition amongst the millions of ice formations can be overwhelming to say the least. 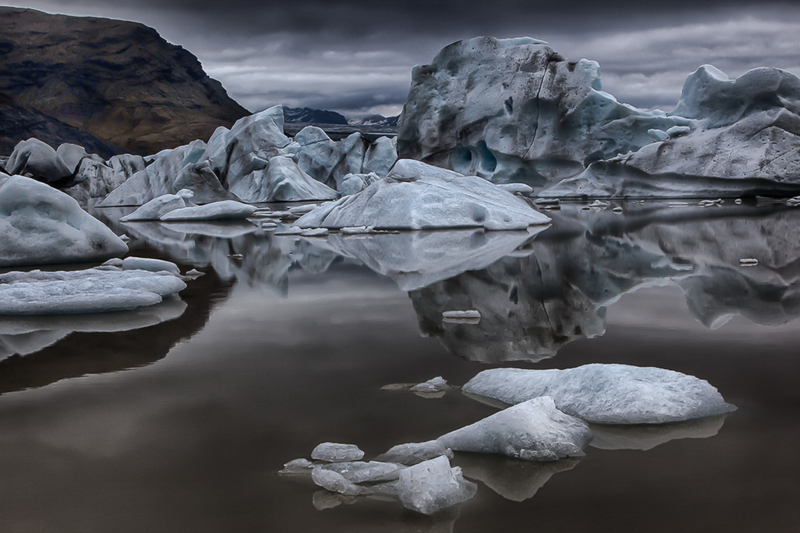 I traveled by small boat through the ice fields to the birthing place of all these ‘ice cubes’… the glaciers in Jokulsarlon. From the silence of the water to the clicking of shutters I was in my element, creating and seeing what I had only glimpsed at in books and magazines. I finished up my trip back at a familiar site… waterfalls. Visiting waterfalls can get a little confusing, due to the sheer number of them. This last one Seljalandsfoss was complete with weather challenges… rain, wind and cold. I knew I was not home in 90 degree heat the minute I stepped out of the van. Walking first in front of this grand waterfall to going behind it, was both a challenge and a culmination of my visit to this island of ‘Fire and Ice’. Even though trying to compose in the rain was difficult, the true beauty of this place reached out and embraced me. If I was to mentally file my trip to Iceland, it would be under ‘O’… “Once in a Lifetime”.